Are you having trouble staying awake and active throughout the day without having that one cuppa hot coffee? 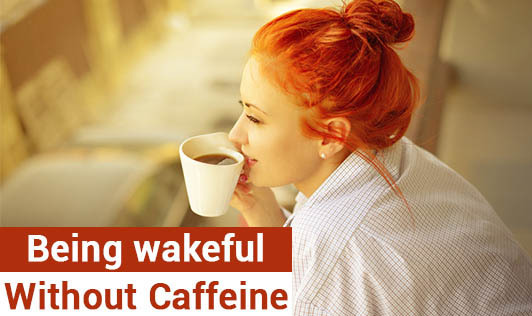 Let me give you some ways to keep yourself awake without the caffeine rush! Light: Your body's natural clock is generally tuned to the amount of light. So, turn on your lights in your room, at your workplace, or just get some sunlight. Don't skip breakfast: It's important to wake up early enough to get something to eat. Skipping meals will knock down your metabolism causing you to gain fat and lose energy. Tickle the top of your mouth cavity: As weird as it sounds, rubbing your tongue against the top front area of your mouth cavity gives you a quick, irritating nerve jolt that can actually help to keep you awake. Chew sugar-free peppermint gum: It definitely won't rot your teeth but it will generate enough physical activity to keep you awake. Cold water: You can splash some cold water on your face as well as the pulse area of your wrists. Drinking ice-cold water can also help to wake you up! Exercise breaks: Try doing some very light exercises, jumping jacks or climbing the stairs to energize your mind and body. Write: If you are trying to stay awake, writing can help, for example, creating a detailed to do list for the week can distract you from falling asleep. You can also try switching from one activity or project to another to keep your mind from becoming lethargic. Stick to a sleep schedule: The best way to be awake is to be well rested. Getting enough sleep on a regular basis can make it much easier for you to stay awake when you absolutely must! So, the next time you're falling asleep at work or elsewhere, try implementing these simple tips mentioned above which can keep you awake without having to depend on Caffeine to get you through the day!